GE Osmonics Pentair TFM-50A RO Membrane is a 12" x 2" standard replacement cartridge with a 50 gallons per day capacity of pure drinking water. Culligan Compatible TFM-50-A RO replacement water filter membrane, made by Pentair reduces many pollutants and contaminants such as fluoride, lead, barium, cadmium, chromium, mercury, nitrate, nitrite, TDS, and more from your water. 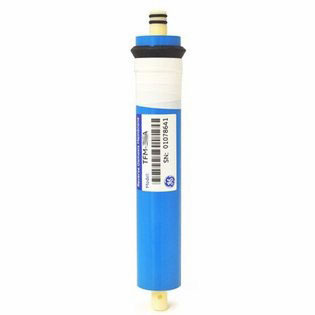 GE TFM-50A Reverse Osmosis membranes were originally designed for Culligan RO systems, and they will also fit many RO systems that use standard TFM membranes with double o-rings at the top tip, and that process between 24 and 150 gallons per day. GE Desal TFM-50A (Thin Film Composite) is manufactured with "Membrane-Separation Technology" which employs crossflow filtration where captured impurities on the membrane are constantly swept away by the concentrate stream. Cross-flow filtration across the membrane then divides the flow into two outflow streams: the cleansed permeate feed and the concentrate or reject stream. This flow provides continuous cleaning that prolongs membrane life and reducing maintenance costs. ANSI/NSF 58 listed for performance requirements. Culligan AC50 and Culligan LC50 RO, Culligan 00-4015-33 RO, Culligan 004015-33 RO, Culligan 00401533 RO, Culligan 01-0060-98 RO, Culligan 010060-98 RO, Culligan 01006098 RO,Culligan 4015-33 RO, Culligan 401533 RO, GE Desal 1224437 RO, GE Desal AG2012TJF RO, GE Desal AG2012TJR RO, GA 323050 RO, Applied Membranes M-T1812AC50 RO. - The GE Desal TFM-50A Membrane is not chlorine resistant. A chlorine taste and odor reduction water filter must be used before the RO membrane if chlorine is present in your water supply.